A 900 sq. ft. studio, plus a generous living space, looking over Crag Lake and Ted Harrison’s original Cabin. This beautiful remote setting has been so appreciated. Kintsukuroi for our planet. Broken, we build anew embracing the flaws. I hope we have enough time. The time and space has been important for me to process the experience of The Arctic Circle Program in the international waters of Svalbard, Norway, and the consequent climate change depression. My resolution is to embrace the fact that our planet is broken, look to a future incorporating the flaws, and build something new and beautiful, like Kintsukuroi, the Japanese art of golden repair, symbolized a teacup with cracks filled with gold. As part of Culture Days, I hosted an artist talk, with a slide show on the expedition and a discussion of this resolution. 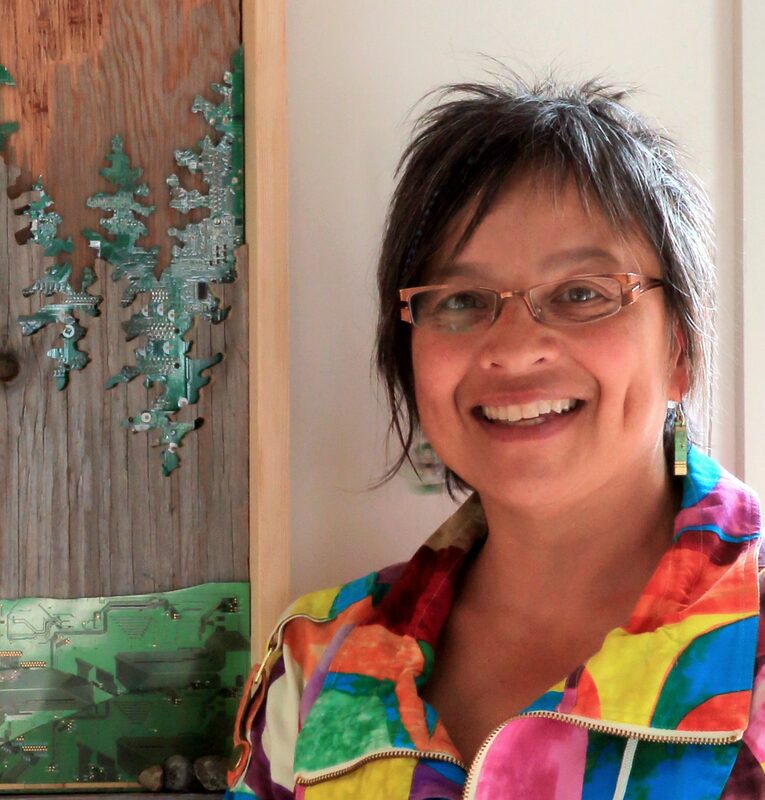 Another Artist Talk will be in Whitehorse in January. Media Coverage: CBC-North radio interview with Marc Winkler, Yellowknife, NWT, Sept. 29, 2018. Broken, a test piece coming through this thinking is a response to a poem by Helen Knott, on exhibit until Oct. 31st in Dawson Creek, British Columbia, as part of the Words North Writing Festival. Thank you Helen Knott for sharing your untitled poem. And thank you Shohei Katayama and Adam Kuby, for laying golden emergency blankets in a glacial crack during The Arctic Circle Artist Residency expedition, June 2018. All three of you are an inspiration. I pulled together a team of three artists and developed a conceptual design for the Grand Hall in the convention centre. My company was awarded a $70K contract for an extensive set of 12-gauge metal cut-outs to be mounted on the four walls of the 56 x 50 foot performance room. Installation is scheduled for March of 2019. Media Coverage: CBC-Yukon radio interview with Meagan Deuling, Whitehorse, Yukon, May 29, 2018. The Arctic Circle Residency, June 2018. Media Coverage: CBC-Yukon radio interview with Tara MCCarthy, Whitehorse, Yukon, May 30, 2018. Hanging throughout Yukon, the Canada 150th Anniversary Tourism banner was replicated from Leslie Leong’s original artwork: a linocut, 15×29 inches, printed with oil based ink, hand coloured with watercolour paint. The banner illustrates Yukon’s unique identity while recognizing its unity with, and contribution to, the rest of the country. Check out more here for photos of the making of the artwork and the final banners in place. Leslie Leong orchestrated a two-week community art-build project in Yellowknife, NWT through the Yellowknife Artist Run Community Centre’s SubARCCtic V residency. Built from construction site 2×4″ off-cuts and reject lumber, a Great Slave Lake creature, named Ascuvus, has become part of the permanent collection of the Northern Frontier Visitors Association. The design and build involved two local schools, residents, tourists and contributing businesses – wow, Yellowknife is so awesome and generous! Check out more here for a discussion of process and design, the completed sculpture and photos during the art-build project. Leslie Leong’s piece “Do Trees Have Memory at Midnight” won the Arts North of Ordinary Cover Competition for the 2016/17 season. Tara McCarthy wrote great article inside and you can read it here. HRH Katherine, The duchess of Cambridge, receives a Klondike Core pendant made by Leslie Leong, Canadian artist, living and working in Whitehorse, Yukon. The core samples are slices of stone cores from mining exploration. During Their Royal Highnesses’ tour of Canada, HRH Katherine, Duchess of Cambridge graciously accepted a gift of my Klondike Core necklace and shook my hand in Carcross, Yukon. See photos of the event are here, and the follow-up thank-you letter here. Since the core sample is actually a slice of Yukon bedrock, I felt it was the best souvenir I could possibly give to HRH Duchess of Cambridge. If you want a necklace like hers, you can find it in my on-line store. “Milk Maid” is presented in opening performance of Junction Artist Residency Gala Fashion Show. The ball gown made from recycled milk jugs, is part of the opening performance of the Junction Artist Residency Gala Fashion Show in Haines Junction, Yukon. The gown was made during the summer artist residence workshop program, “Sewing Through the Landscape.” More images during the event with model, Lyn Fabio can be found here. Milk Maid continues to be a feature display at “reDesign: the craft fair” held annually in November, featuring a collection of artisans embracing creative reuse by working with discarded and salvaged materials to make new products. In this exhibition Leslie brings photography back into her art practice, as it is one of the mediums in which she holds a special skill. She has authored two photography books on the North and provided editorial and stock photos for countless books, magazines and advertising. In this exhibition, Leslie’s fascination with contrast, texture, pattern and form is evident. You can view the Beyond Focus Exhibition on-line. For two consecutive years Leslie was selected as one of the five demonstrating and exhibiting artists for the weekend en plein air event, Created in the Canyon and subsequent exhibition. One year Leslie created paper vessels and the other year, linocut prints. You can view the resulting paper vessels as well as others on-line. And her linocut prints and more are also on-line. You can view the Insidious Exhibition on-line. You can view the Metal-Stone-Clay Exhibition on-line. “Shift” named for it’s altered perspective on materials, reflection on the state of our society, the rethinking of stuff and our throw-away society, the remaking, reuse and recycling of stuff into art pieces that have a lasting quality in counter-action to designed obsolescence in today’s manufactured goods. Rather than confining her creativity to any one medium, Leslie lets the material determine the medium, mixing of the technical with the creative in a variety of forms and media. From industrial design, or rather re-design, to abstract photographs, to jewellery using alternative materials, this exhibit may open minds to alternate possibilities. You can view the Shift Exhibition on-line. Blood-letting, a ceremonial act with the intent of creating a higher degree of consciousness. “I am tired of us behaving like good little citizens in our industrialized society like cogs in a mechanized apparatus. I want people to think, to question, to live consciously. If nothing changes, then at least we have actively chosen the way things are, and we can only blame ourselves and the choices we make. I suspect that if people truly question things, and make intentional choices, then they will be unable to live their lives in the same manner. They will become discontent with the status quo, be invigorated by what is possible, and work towards achieving that. You can view the Blood-letting Exhibition on-line. Crafty Types Take Trash, Make Treasures, Yukon News.